Home › Blog › Pets Need Their Teeth Brushed Too! DID YOU KNOW THAT FEBRUARY is Pet Dental Health Month? That’s right! Your pets need their teeth taken care of too! While their teeth don’t require quite as much attention as ours do, your pet’s teeth still need a little tender loving care to keep them healthy. Brushing our teeth removes plaque and prevents gum disease; the same goes for dogs and cats! Brushing your dog or cat’s teeth three to four times per week can prevent dental disease and extend their life. It can also save them a lot of pain and you a lot of money on veterinary visits! It’s important not to use regular human toothpaste for your pet. Since dogs and cats can’t spit the toothpaste out, the high fluoride content can really upset their stomachs and can even be toxic. You can find toothpaste specifically made for pets that’s not only safe, but appeals to their taste buds too! Just as chewing sugarless gum after you eat helps increase saliva production and remove plaque, chew toys contribute to your pet’s dental health in between brushing sessions. Getting your pet a chew toy or hard bone can strengthen their teeth and gums as well as scrub plaque off of their teeth! 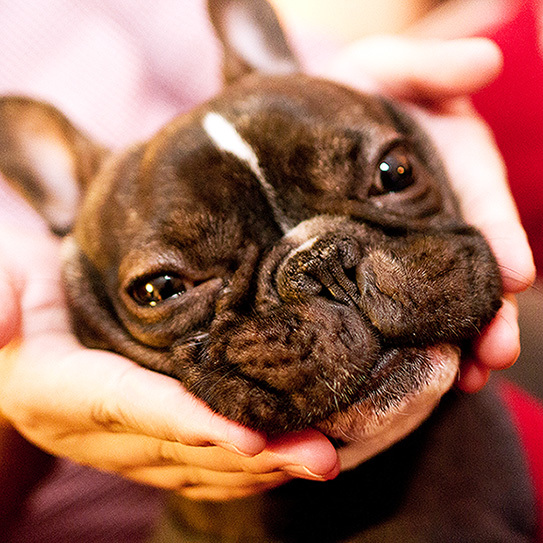 Biannual or annual visits to your veterinarian help keep your pet’s mouth and body healthy. When you come in to the dentist for your biannual visit, we not only clean your teeth, but check for signs of more serious conditions such as periodontal disease and oral cancer. Routine checkups for your pet are just as essential for their health. Sadly, statistics suggest that over 80 percent of dogs and cats have some degree of dental disease by the time they are three years old. Remember, a healthy mouth means a happy life. That goes for you and Sparky! If you have any questions about YOUR dental health, call us or come in today! We love our patients (and their pets)! Top image by Flickr user Guian Bolisay used under Creative Commons Attribution-Sharealike 4.0 license. Image cropped and modified from original. ‹ Our Hidden Superpower: Smiling!